Besides skiing Mt Bachelor in Oregon, there is plenty to do during your visit to Central Oregon. Dog sledding and tubing are available right at Mt Bachelor’s base. We recommend snowmobiling in the Deschutes National Forest. Close to the ski slopes of Bachelor, just a three mile drive, is Wanoga Snow Park where you can rent snowmobiles. Central Oregon Adventures has been offering snowmobile excursions from Wanoga Snow Park since 2002, with a fleet of Ski Doo snowmobiles and a handful of experienced guides. This snowmobile tour company prides themselves on new sleds, rotating their fleet of over 30 sleds every three years. Their guides are super knowledgeable about Deschutes National Forest, snowmobile safety, avalanche and snow safety. You start your snowmobile outing at their Yurt, warm and cozy with a wood burning fire, where you are outfitted with a helmet and goggles, clothing and boots are available if you need, but ski clothing works too. Then you are familiarized with your Ski Doo before hitting the trails. Central Oregon Snowmobile Tours has access to 280 miles of groomed trails in the Deschutes National Forest, so many trails and over 250,000 acres of diverse terrain from ponderosa pine paths to wide open snow fields with spectacular views of the volcanic Sisters and Broken Top and Mt Bachelor where you just skied. You can rent your own sled and tour the trail system on your own, you need a driver’s license, same rule applies to teenagers wanting to snowmobile – must be licensed drivers, or they can ride tandem with their parents. A guided snowmobile tour is the other option which we chose. We got our own sleds, but loved having our guide show us around the vast beautiful forested trail network. I felt more comfortable having a trained guide with mechanical and rescue knowledge, plus he provided tips on how to be a more skilled rider, since this was a new sport for us skiers, although many of the same principles apply – skiing versus snowmobiling. Start up your sled and snowmobile right from Wanoga Sno Park outside the yurt, very convenient. After several miles snowmobiling on well groomed snow paths, following our guide and feeling more proficient with accelerating, steering, and leaning into my turns, our Abel guide (his name) took us into some wide open untracked snowfields where we could open up the throttle and enjoy speeding across the fresh snow… fun. Most snowmobile tour companies govern your speed to a pokey 10 mile per hour in a strict train formation, not the case here at Central Oregon Adventures. As our skill and comfort improved so did our speeds and the steepness and turns of the terrain. Soon, he had us heading up a more tricky ascent on Moon Mountain on our well powdered, easy to maneuver Ski Doo. At the summit of our snow crest, we stopped, shut our machines down and enjoyed the silence, the spectacular Cascade mountain scenery and our success so far on our snowmobile excursion. There were even fist pumps as Abel told us we were doing very well. He asked how we were feeling, if the speed and terrain were what we liked. I was thrilled, I had underestimated how much fun it is to fly around on a snowmobile. Being a skier first and foremost, I had previously thought of snowmobiles as loud, disrupting the peace and quiet, scaring the wildlife and tracking up backcountry terrain instead of leaving it pristine for ski touring. Well now I see the flipside. Snowmobiling is a very cool way to see the Deschutes National Forest, explore fields and snowy woods, even see some wildlife tracks. Suddenly I could overlook the gas guzzling and din of my snowmobile motor. The two hour Deschutes tour offers many miles of sledding, before your return to Wanoga Sno-Park. We passed a dog sledder out running his beautiful snow-loving huskies- he waved. I was grateful to find this amiable co-existence. We slowed down when we encountered hikers, skiers and sledders, which was rare with such vast terrain. We saw cross country skiers enjoying the trail system too – there is signage indicting intersecting trails and those sections of trail that are designated for motorized versus non-motorized travel- very well separated for safety in certain higher traffic areas. Your snowmobile tour can be 2 or 4 hours, you can reach beautiful lakes like Sparks, Hosmer and Elk Lake or be more leisurely and stop for a picnic lunch on your excursion. 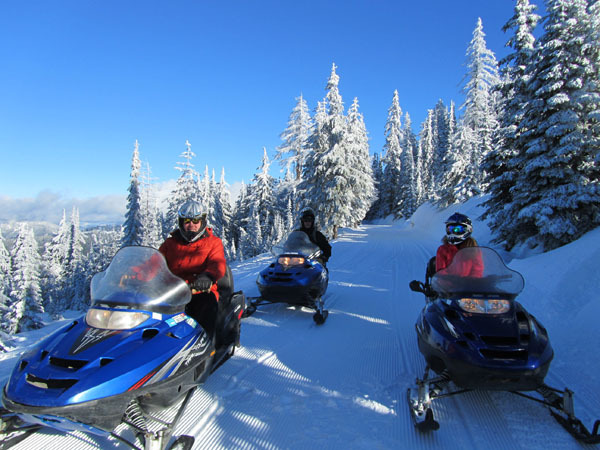 The two hour snowmobile tour is a great après ski activity in the afternoon, since its located on the Cascade Lake Highway from Bachelor on your way back to Bend or Sunriver where you will be lodging during your Mt Bachelor ski vacation. A two hour tour costs $125 for a sled, the four hour snowmobile excursion starts at $165 per person with Central Oregon Adventures. They also offer Sunset Tours with dinner. See videos of Skiing Mt Bachelor and our review of Mt Bachelor Oregon skiing.